The answer is, or should be, a good playing surface at all of those stadiums with plenty of grass on them, very different from the pitch we have seen for the last decade at Turf Moor, a pitch that is often left in a terrible state during the latter months of the season. 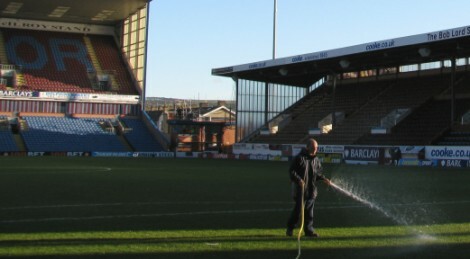 The other thing all those stadiums, and others, have in common is that they have had Desso Grassmaster pitches installed and that's exactly what's going on at Turf Moor right now ahead of the 2010/11 season. The installation started a couple of days after the last game against Spurs and will be ready just in time for the pre-season game against Stoke on the last day of July, one week before the Championship season gets underway. The installation, which includes a new irrigation and under-soil heating system, is costing the club £750,000 but what is a Desso Grassmaster pitch? Put simply it is a pitch of natural grass enhanced by artificial fibres. The artificial grass fibres are injected 20 cm deep and cover 3% of the surface. During the growing process, the roots of the natural grass entwine with the synthetic grass fibres and anchor the turf into a stable and even field. The roots of the natural grass intertwine with the fibres and anchor the field to create a solid structure with better drainage and optimal playing comfort. These pitches have come in for some praise over the last couple of years, and having twice visited the almost bowling green condition of the Emirates in early March it isn't difficult to see why. Hopefully this will see a much improved surface at Turf Moor and an end to some of the surfaces witnessed over recent years along with the waterlogged state we saw in the recent home game against Manchester City.